I don't know exactly where I stand on guns, but for a long time I hated them. Now listening to my radio Station with Dave Glover, they have a lot of talk about Guns. Mostly in their Guns, Ammo and Liquor segment. Really it's a just fun discussion about types of guns and wines. Go figure. The discussions definitely have me leaning the other way. But... with the recent shooting in Newtown, my beliefs have been thoroughly shaken. Everything needs to be re-examined. I'm appalled at the NRA's director's comments. I am never in favor of someone who has convictions that so override common sense. I understand gun advocacy. I understand the genie is out of the bottle with so many guns out in people's hands. I also understand what we as American's are doing is NOT WORKING. Lots of essay's have come out over the past month, but I haven't re-posted because I wanted more info. I do think this latest one has some pretty solid arguments. The gut-wrenching shock of the attack at Sandy Hook Elementary School on December 14 wasn't just due to the 20 unthinkably young victims. It was also due to the realization that this specific, painfully familiar nightmare was unfolding yet again. 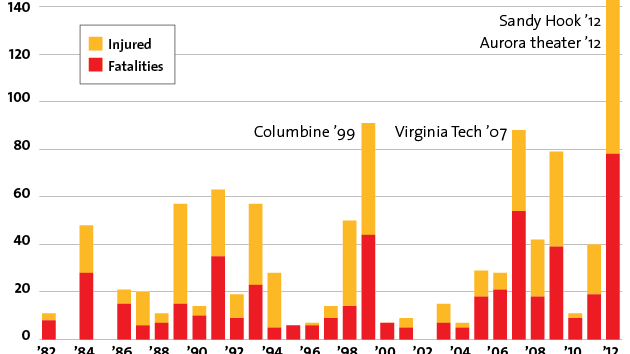 As the scope of the massacre in Newtown became clear, some news accounts suggested that mass shootings in the United States have not increased, based on a broad definition of them. But in fact 2012 has been unprecedented for a particular kind of horror that's been on the rise in recent years, from Virginia Tech to Tucson to Aurora to Oak Creek to Newtown. There have been at least 62 such mass shootings in the last three decades, attacks in which the killer took the lives of four or more people (the FBI's baseline for mass murder) in a public place—a school, a workplace, a mall, a religious building. Seven of them have occurred this year alone. Along with three other similar though less lethal rampages—at a Portland shopping mall, a Milwaukee spa, and a Cleveland high school—2012 has been the worst year for these events in modern US history, with 151 victims injured and killed. More than a quarter of them were young children and teenagers. The National Rifle Association and its allies would have us believe that the solution to this epidemic, itself but a sliver of America's overall gun violence, is to put firearms in the hands of as many citizens as possible. "The only thing that stops a bad guy with a gun is a good guy with a gun," declared the NRA's Wayne LaPierre in a press conference a week after Newtown, the same day bells tolled at the National Cathedral and the devastated town mourned its 28 dead. (That day a gunman in Pennsylvania also murdered three people and wounded a state trooper shortly before LaPierre gave his remarks.) LaPierre explained that it was a travesty for a school principal to face evil unarmed, and he called for gun-wielding security officers to be deployed in every school in America. As many commentators noted, it was particularly callous of the NRA to double down on its long-standing proposal to fight gun violence with more guns while parents in Newtown were burying their first graders. But more importantly, the NRA's argument is bereft of supporting evidence. A closer look reveals that their case for arming Americans against mass shooters is nothing more than a cynical ideological talking point—one dressed up in appeals to heroism and the defense of constitutional freedom, and wholly reliant on misdirection and half truths. If only Sandy Hook's principal had been packing heat, the argument goes, she could've stopped the mass killer. There's just one little problem with this: Not a single one of the 62 mass shootings we studied in our investigation has been stopped this way—even as the nation has been flooded with millions of additional firearms and a barrage of recent laws has made it easier than ever for ordinary citizens to carry them in public places, including bars, parks, and schools. But those facts don't matter to the gun rights die-hards, who never seem to run out of intellectually dishonest ammo. Most recently, they've pointed to the Portland shopping mall rampage earlier in December, in which an armed civilian reportedly drew his gun but thought twice about potentially hurting an innocent bystander and ducked for cover instead of firing. The assailant suddenly got scared of this retreating good guy with the gun, they claim, and promptly shot himself dead. Obviously. Another favorite tactic is to blame so called "gun-free zones" for the carnage—as if a disturbed kid shoots up a school, or a disgruntled employee executes his coworkers, or a neo-Nazi guns down Sikhs at worship simply because he has identified the safest place to go open fire. All we need to do is make sure lots of citizens have guns in these locations, and voilà, problem solved! For their part, law enforcement officials overwhelmingly hate the idea of armed civilians getting involved. As a senior FBI agent told me, it would make their jobs more difficult if they had to figure out which of the shooters at an active crime scene was the bad guy. And while they train rigorously for responding in confined and chaotic situations, the danger to innocent bystanders from ordinary civilians whipping out firearms is obvious. Exhibit A: the gun-wielding citizen who admitted to coming within a split second of shooting an innocent person as the Tucson massacre unfolded, after initially mistaking that person for the killer, Jared Loughner. The NRA's LaPierre was also eager to blame violent video games and movies for what happened in Newtown, and to demonize the "unknown number of genuine monsters" walking among us. Never mind that the failure to recognize and treat mental health problems is a crucial factor in this dark equation: Of the 62 mass shootings we examined, 36 of them were murder-suicides, while assailants in seven other cases died in police shootouts, widely considered to have been "suicide by cop." Those who are serious about contending with the problem of mass shootings understand that collecting and studying data is crucial. Since we began our investigation after the attack in Aurora in July, we've heard from numerous academic researchers, legislative aides, and others wanting access to our full data set. We've now published it here. The question now isn't whether most Americans will take seriously the idea of turning every grammar school in the nation into a citadel. (Here, too, the NRA's argument falls apart; an armed sheriff’s deputy at Columbine and a robust security force at Virginia Tech didn't stop those slaughters from occurring.) Now that we've just witnessed the worst year for mass shootings in memory, including 20 of the most innocent of lives snuffed out, what remains to be seen is whether real reform is finally on the way on Capitol Hill. Despite years of this kind of carnage, next to nothing has been changed in our legal system with respect to how easy it is for a disturbed young man to get his hands on a military-style assault rifle and a stockpile of highly lethal ammunition. Sen. Diane Feinstein has vowed to introduce a new ban on assault weapons when Congress reconvenes in January. President Obama has signaled that the gun issue will be a real priority going forward. But once the raw emotion of Newtown dissipates there will be the danger of slipping back into the same inertia and political stalemate so successfully cultivated by the pro-gun ideologues. Soon lawmakers will start eyeing their 2014 reelection campaigns and thinking about how much money the NRA has in its coffers to take aim at them with should they dare to dissent. This time, have we finally had enough? All of Obama's talk about Gun Reform will amount to....nothing. We see this time and again after every shooting about how they will NOW change the gun law because "enough is enough". At the end of the day, each and every politician is just doing lip service until the public moves onto something else to protest and they won't have to go through with their proclamations. The NRA Claims the AR-15 Is Useful for Hunting and Home Defense. Not Exactly. Three makes a trend, as we all know, and many people have reacted by suggesting that the federal government should ban the AR-15 and other so-called assault weapons. Gun advocates have responded with exasperation, saying that, despite appearances, AR-15-style rifles are no more dangerous than any other gun. In a piece today on humanevents.com titled “The AR-15: The Gun Liberals Love to Hate,” NRA president David Keene blasted those critics who “neither understand the nature of the firearms they would ban, their popularity or legitimate uses.” Keene noted there are several valid, non-murderous uses for rifles like the AR-15—among them recreational target shooting, hunting, and home defense—and argued that law-abiding firearms owners shouldn’t be penalized because of homicidal loners who use semi-automatics like the AR-15 for criminal purposes. I generally consider myself a Second Amendment supporter, and I haven’t yet decided where I stand on post-Newtown gun control. I would own a gun if New York City laws didn’t make it extremely difficult to do so. But I nevertheless find Keene’s arguments disingenuous. It’s odd to cite hunting and home defense as reasons to keep selling a rifle that’s not particularly well suited, and definitely not necessary, for either. Bolt-action rifles and shotguns can also be used for hunting and home defense. Unfortunately, those guns aren’t particularly lucrative for gunmakers. The lobby’s fervent defense of military-style semi-automatic weapons like the AR-15 seems motivated primarily by a desire to protect the profits in the rapidly growing “modern sporting rifle” segment of the industry. The AR-15 was designed in 1957 at the behest of the U.S. Army, which asked Armalite to come up with a “high-velocity, full and semi auto fire, 20 shot magazine, 6lbs loaded, able to penetrate both sides of a standard Army helmet at 500 meters rifle,” according to ar15.com. When it entered Army service in the 1960s, it was renamed the M16, in accordance with the Army Nomenclature System. “AR-15” came to refer to the rifle’s semi-automatic civilian equivalent. From 1994 to 2004, AR-15-style rifles were subject to the now-expired Federal Assault Weapons Ban. Since then, the rifle and others like it have become tremendously popular. Last month, I estimated that upward of 3.5 million AR-15-style rifles currently exist in the United States. People like the rifle because it is modular and thus customizable (one article calls the AR-15 “perhaps the most flexible firearm ever developed; in seconds, a carbine can be switched over to a long-range rifle by swapping upper receivers”), because it is easy to shoot, and because carrying it around makes you look like a badass. AR-15-style rifles are very useful, however, if what you’re trying to do is sell guns. In a recent Forbes article, Abram Brown reported that “gun ownership is at a near 20-year high, generating $4 billion in commercial gun and ammunition sales.” But that money’s not coming from selling shotguns and bolt-action rifles to pheasant hunters. In its 2011 annual report, Smith & Wesson Holding Corporation announced that bolt-action hunting rifles accounted for 6.6 percent of its net sales in 2011 (down from 2010 and 2009), while modern sporting rifles (like AR-15-style weapons) accounted for 18.2 percent of its net sales. The Freedom Group’s 2011 annual report noted that the commercial modern sporting rifle market grew at a 27 percent compound annual rate from 2007 to 2011, whereas the entire domestic long gun market only grew at a 3 percent rate. As the NRA’s David Keene notes, a lot of people do use modern sporting rifles for target shooting and in marksmanship competitions. But the guns also appeal to another demographic that doesn’t get nearly as much press—paranoid survivalists who worry about having to fend off thieves and trespassers in the event of disaster. Online shooting message boards are rife with references to potential “SHTF scenarios,” where SHTF stands for “**** hits the fan”—governmental collapse, societal breakdown. (Adam Lanza’s mother, Nancy Lanza, has been described as “a gun-hoarding survivalist who was stockpiling weapons in preparation for an economic collapse.”) An article on ar15.com titled “The Ideal Rifle” notes that “the threats from crime, terrorism, natural disaster, and weapons of mass destruction are real. If something were to happen today, you would need to have made a decision about the rifle you would select and be prepared for such an event. So the need to select a ‘survival’ rifle is real. Selecting a single ‘ideal rifle’ is not easy. The AR-15 series of rifles comes out ahead when compared to everything else.” Depending on where you live, it’s perfectly legal to stockpile weapons to use in the event of Armageddon. But that’s a far different argument than the ones firearms advocates have been using since the Newtown shootings. As I said, I generally think of myself as a Second Amendment supporter, and a month ago, I would’ve probably agreed with the NRA’s position. But the Newtown shooting caused me to re-examine my stance—as is, I think, fitting—and to question some of the rhetoric advocates use to defend weapons like this. In his piece at Human Events, Keene ridiculed the notion that AR-15-style rifles ought to be banned just because “a half dozen [AR-15s] out of more than three million have been misused after illegally falling into the hands of crazed killers.” And, sure. But the AR-15 is very good at one thing: engaging the enemy at a rapid rate of fire. When someone like Adam Lanza uses it to take out 26 people in a matter of minutes, he’s committing a crime, but he isn’t misusing the rifle. That’s exactly what it was engineered to do. As gun rights activists celebrated the turnout at gun shows for national Gun Appreciation Day Saturday, police responded to at least thee accidental shootings that left five people injured at shows across the country. A 12-gauge shotgun discharged shortly after 1 p.m. as its owner unzipped its case on a table for a security officer to check it at a security entrance at the Dixie Gun & Knife Show, according to Joel Keith, police chief of the state Agriculture Department. Keith said birdshot pellets hit Janet Hoover, 54, of Benson, in the right torso; Linwood Hester, 50, of Durham, in the right hand; and Jake Alderman, a retired Wake County sheriff’s deputy from Wake Forest, in the left hand. Hoover and Hester were taken to WakeMed, but officials said their injuries did not appear to be life-threatening. Jim Conrad, event organizer, said there were about 200 people there at the time, and they heard one gun shot. Conrad said a visitor to the event had handed an exhibitor his gun to look at. It apparently was loaded, and while the exhibitor was looking at the gun, it accidentally went off, hitting another man in the arm. Meanwhile, gun rights advocates touted Gun Appreciation Day -- which was organized to oppose efforts in Washington, D.C. to pass new gun regulations after Newtown -- as a success. Dave Workman, a former NRA board member, wrote that gun rights activists in Washington state showed up in big numbers at a gun show in Puyallup and a rally in Olympia. "Among many of these gun owners is a newfound activism, ignited by the gun prohibition rhetoric over the past month, and stoked by the president’s remarks earlier in the week," he wrote. Guns don't kill people, but stupid people aren't helping either. Watch out, kid's packing bubbles!!!! I think a balanced, reasonable discussions need to take place. Gun advocates don't need to put blinders up and Gun non-advocates don't need to go overboard the opposite way. This just polarizes people and sometimes make up their minds to be contrary. I like what King suggests here. Horror writer Stephen King is seeking to provoke a discussion on gun control and gun rights following the school shooting massacre in Newtown, Conn.
Today must be a National Holiday for Dumb people. Sheesh! ... but, they do go deep in politics, finances, news stories, when they are of significance. They even have a segment called Liquor, Guns & Ammo. After listening to it for a number of years I've learned a great deal and more accepting of guns... in general. While that thought has shifted, so has my thoughts on gun violence. It's bad in two ways. In my mind, I'm screaming to the masses... 'Folks, you better get used to this news of gun violence. Kids being killed by guns. Senseless slaughtering. It's going to be normal to hear about this every day. New Town is only the beginning." and at the same time it bad and sad, that this will be the way people think. This is normal. Kids getting slaughtered will be old news. It becomes less jarring and numbing. Pretty soon folks won't think about it until it effects them. Bottom line, I think the NRA needs to step back and less rigid and the liberals need to bring common sense, emotionless suggestions and balance... so that even a conversation can happen. This story is nuts and scary. I've been watching as many updates as possible. We've had a lot of false sightings down here with people claiming to have seen him. When I heard about the Cops open firing on the two women in the truck because they assumed it was his, I immediately knew that the cops were validating Dorner's claim of 'shoot first, ask questions later' claim. Crazy, but true. 3D-Printed Guns - Would Gun Laws Even Matter? CSI: NY actually did an episode focusing on a 3D-Printed Gun earlier this season. It's crazy to think that this will become a reality in the future and sooner than you think. New gun control ad: Which of these is more dangerous for kids? Gun control advocacy group Moms Demand Action launched a campaign on Monday putting the “one of these things is not like the other” game to startling visual effect. 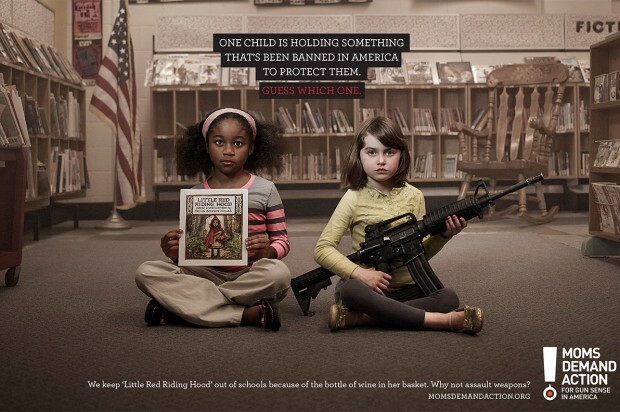 In a series of ads, children hold assault weapons alongside items that have been banned by the federal government (like “Kinder Surprise” chocolate eggs) and local school districts (an edition of “Little Red Riding Hood” depicting a bottle of wine in the young protagonist’s picnic basket) for being too “dangerous” for kids.